Olive Oil, Distilled Water, organic and sustainable Palm Oil, Coconut Oil, Lye, Castor Seed Oil, Shea Butter, Goat Milk Powder, Almond Milk & Honey Fragrance Oil, Honey, Oxide for color. This soap is the bees knees! 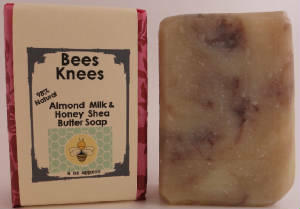 With all the health benefits of honey, goatmilk, Shea Butter and a light almond scent– you just can’t go wrong. Why is this soap for you? Honey is a natural healer! This great unisex scent blend works for men and women. The goatmilk adds a creaminess to the lather. The honey is a natural antioxidant and also has antiseptic and antibacterial properties. Take me back to the Soap Page, please!